I have a sneaky suspicion you didn't read that last sentence quite right. Try it again. It is raining here. Still. It's raining here. In Arizona. If you're one of my blogger friends living in a region of our world currently laden with snow, you may be wondering what the big deal is, but, trust me, it's a big deal. I live in southern Arizona where we just don't get steady showers of rain. In the summer we have a monsoon season in which it is supposed to rain every afternoon for about a month and a half. But these are quick downpours that lasts about as long as your morning shower. They rush in just long enough to soak the beach towel you left laying by the pool and out again before you can even dry off from getting out of said pool. And once a monsoon shower is gone, you look around you for the puddles it left behind only to find everything has already dried out in the Arizona sun. But today it is raining. Really raining. It started raining sometime before 3:00 a.m. and as of 7:10 it hasn't stopped. You think it's dangerous driving in the snow or ice. Consider getting on the roads here this morning where people don't even remember how to turn on their windshield wipers, and some of them will discover that their wipers have suffered dry rot since they last used them and amount to nothing more than a crumbly mess. I've prayed all morning long for my daughter to get to school safely. Seriously. Rain in the desert southwest is indeed an unusual occurrence. But we shouldn't be surprised. God said He will send rain on the just and the unjust. I'm not sure which we are here in Arizona, but the point is that God sends showers of blessing as He sees fit to whomever He desires. Have you ever been surprised, taken aback, left speechless over a blessing sent by God? Ever wonder what in the world you did to deserve such goodness? I'm talking about the kind of surprise blessing that you didn't even suspect was around the bend, hadn't even worked toward, or conjured up on your own. Has it rained in your desert? Maybe a good friend called or stopped by just when you needed a lift. Maybe you won an award you didn't even know you were in line for. Maybe you got a raise you weren't expecting. Maybe the doctor announced you were having not one bundle of joy, but two. It rained in my desert last year when my son won a full scholarship to college. It rained in my desert when I was asked to speak to a precious group of ladies in New Mexico this past fall. It rained in my desert when my daughter got one of the lead roles in an upcoming play. It rained in my desert when we received a sizable gift card to Sears last Christmas, enough to pay for new tires. It rained in my desert when Beth Moore announced the free Living Proof Live in Houston for scripture memory participants and later threw in a all-expenses-paid room at a very nice hotel. Pitter, patter, pitter, patter. Don't you just love rain in the desert? The thing about rain in the desert is that we're not used to it, so when it rains like this we celebrate by going a little overboard and doing things like blogging about it. We listen intently to it. Walk in it on purpose. Watch it through our windows. Get out and drive in it on purpose (after we locate the windshield wipers that is). That's kind of how it is when you receive an unexpected blessing isn't it? You relish it, soak in it, enjoy it and tell everyone about it. Take it from someone who is enjoying the sound of rain (Still! It's still raining!) this morning and even blogging about it, for pete's sake! 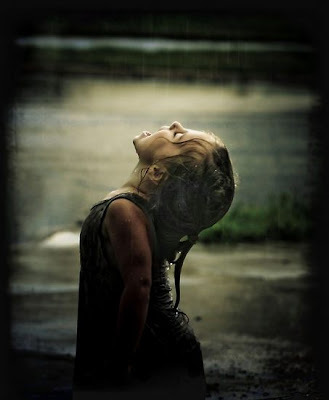 All rain is wonderful and a gift from God. I'm not talking about the rain that causes your rivers to overflow and causes mudslides and floods your homes, of course. But that gentle, nourishing rain that sometimes spoils your picnic plans or causes you to have to leave a little earlier for work? Worth celebrating. I grew up in Georgia where it rained pretty regularly (except during a few droughts) and I know what it means to take rain for granted. I even know what it means to get a little sick of it. But the truth is, good, regular, dependable rain is worth celebrating. More importantly, every blessing from God - the food on my table, the health of my children, the ability to put on clean clothes in the morning, a bed to sleep in, the roof over my head - is worth celebrating. These and others are the ones we often take for granted, but should be ever so grateful for. I'd love to hear about how it's "rained in your desert" lately. Won't you share an unexpected blessing that you're still giddy over? Or maybe you'd like to just share one of those everyday rain shower kind of blessings. The kind you can count on like clockwork, kind of like a monsoon storm. One you've taken for granted, but now you want to thank the Lord for.